Streetcars are an inexpensive and favorite way to navigate much of the city. You pay $1.25 in cash when you board or buy a Jazzy pass for a one-, three or 31-day unlimited ride. These cost $3, $9 and $55, respectively, as of April 2019. You can also pay from the Regional Transit Authority's downloadable app. For information on routes or where to buy passes, check the RTA's website. New Orleans has five streetcar lines, the most famous being the St.
Charles Line, which runs in the so-called American sector of New Orleans. Now, you might say to yourself, isn't all of New Orleans "American?" Canal Street, a major thoroughfare, divides the city into two historically distinct areas: the old Creole section known as the French Quarter, and the section populated by the nouveau Americans who moved in after the Louisiana Purchase. The historic St. Charles Avenue streetcar, which runs in and past storied streets on a 13-mile route, is a tourist bargain at $1.25 per ride. If you buy a pass, you can get off and on to take a closer look (or photos) at places that catch your interest. 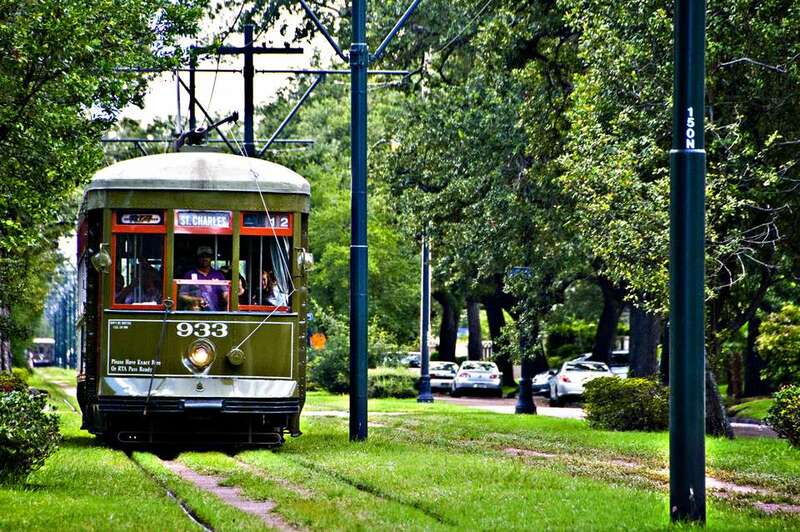 You can catch the beloved old green cars all along St. Charles Avenue, which runs from Canal Street downtown, toward the University Section and Audubon Park uptown, under a canopy of live oaks, past antebellum mansions, and Loyola and Tulane universities. You'll get a feel for the old New Orleans on this ride; inside, the cars still sport mahogany seats and brass trim, and your view out the window shows you the glory of New Orleans' past. The most popular place to catch the St. Charles Streetcar is at Canal and Carondelet streets since most tourists stay in hotels in the French Quarter or downtown. The streetcar stops are rather nondescript; just look for the yellow sign that reads "Car Stop" on a pole near the corner. The Canal Street Line covers a 5.5-mile route from the foot of Canal Street into the Central Business District and into the mid-city area and winds up at City Park Avenue and the historic cemeteries there. The Riverfront Line's route takes you to the French Market shops, the Aquarium of the Americas, Riverfront Marketplace, Canal Place and Harrah's. The Loyola/UPT Line, which began service in 2013, takes train and bus passengers from the Union Passenger Terminal to Canal Street and the French Quarter. These are modern cars with air conditioning; don't expect a tourist experience. The newest line, the Rampart/St. Claude Streetcar links the Marigny/Bywater area to the Union Passenger Terminal and gives good access to the French Quarter and the Treme neighborhood. The streetcars run 24 hours a day, except during Mardi Gras parades. During peak hours, they come along about every five minutes. Keep your head and limbs inside the car at all times because they pass within inches of telephone poles and trees. The seat backs reverse, so you can adjust them to face your companions. To stop the streetcar, pull the overhead wire. The conductors are usually happy to call out your stop if you tell them where you want to go.